Since 1999, we've assisted happy customers throughout all of Green Bay, and Northeastern Wisconsin by providing wood heating solutions that lower, and even eliminate, the high heating bills associated with LP, natural gas, and fuel oil. From the start, we decided that to do it right we'd concentrate on our customers, and only the best built, most efficient, wood, and pellet heating products on the market. Renewable Energies, LLC is dedicated to the design, installation, and service of quality, high performance wood heating systems like the popular Central Boiler Outdoor Wood Furnaces. After 19 years of business, and more than 1000 wood, and pellet furnace installations we've seen proof of cost saving over and over again. The majority of our customers see payback on their investment in just a few short years. It easy to see why. A Central Boiler Outdoor Wood Furnace can supply 100% of the heat for your home, shop, and all of your domestic hot water needs—including your pool, and more. At Renewable Energies, LLC we also offer a variety of Indoor Wood Furnaces by Energy King, along with Indoor Corn and Pellet Furnaces, and Boilers by A-Maize-Ing Heat. To increase your energy performance standards contact us today, and you'll be on your way to energy independence. 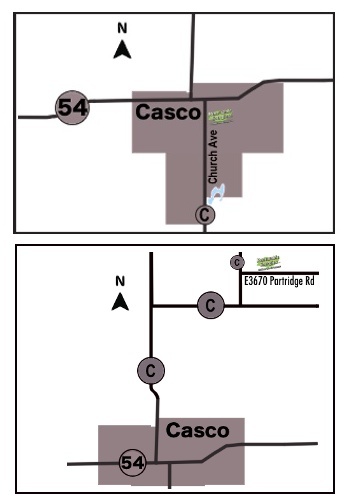 Update: As of late Sept 2018, we are now located in Casco, WI - our new office is located just one block south of Hwy 54 on Church Ave (County Hwy C - see map to right) and our new Retail Location is located just north of Casco, WI on Partridge Rd - just East of Hwy C (see map to bottom right).